I’m not always the best at saying, “Yes” to my boys. We’re definitely not in the parenting camp of never saying no. We aren’t afraid to say no and set boundaries when we need to. But I like to say yes when I can, especially when one of the boys asks to do a puzzle, for me to read a book, or when they want to do an art project. I’m not always the best at saying yes, because I generally like things to be neat. And crafting is rarely neat. 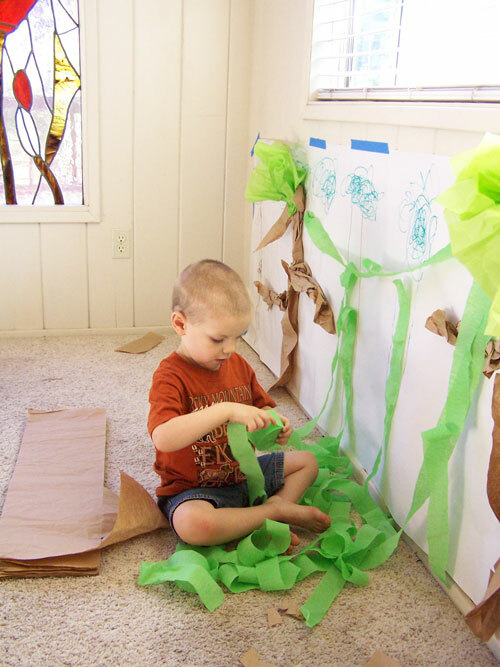 Last Thursday Malcolm asked if we could make the house into a jungle, with paper trees and vines. At first, I told him no, but maybe another time. The reason he wanted to make a jungle was kind of cute. We’ve been watching Amazon’s Creative Galaxy . I’d seen it recommended a few times, but wasn’t sure it was something we were going to like. We decided to give it a go last week, and absolutely loved it! It’s all about Arty, a little alien boys who loves art and goes on art adventures. 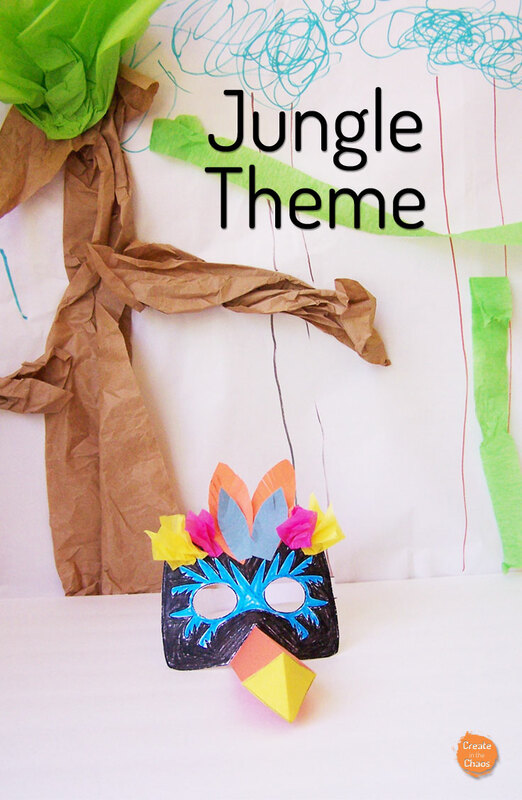 They do art projects, learn about famous artists, and even show real kids making some cool crafts. I think I’ve mentioned before that kid shows usually drive me crazy, and I only have a few favorites (like Backyardigans and Veggie Tales), but Creative Galaxy is definitely being added to that list. Creative Galaxy is an Amazon Prime show, but they have the first episode up for free if you want to check it out . 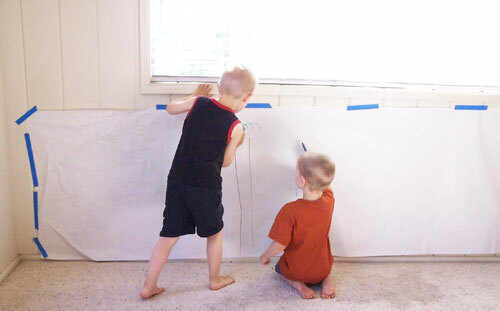 Often what would happen is we would watch an episode and then the boys would want to go replicate the crafts they saw. In fact, I’m pretty sure they have a whole list of crafts they want to do now. 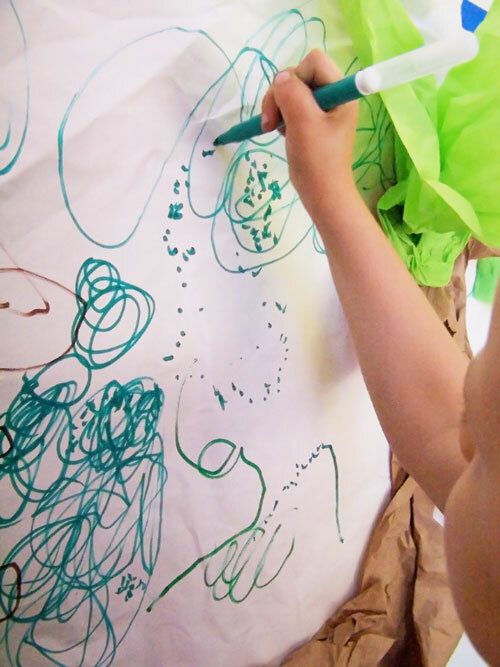 I love encouraging the boys to be creative, and I love seeing what they come up with. So when Malcolm asked again if we could make a jungle Thursday evening, I said yes. 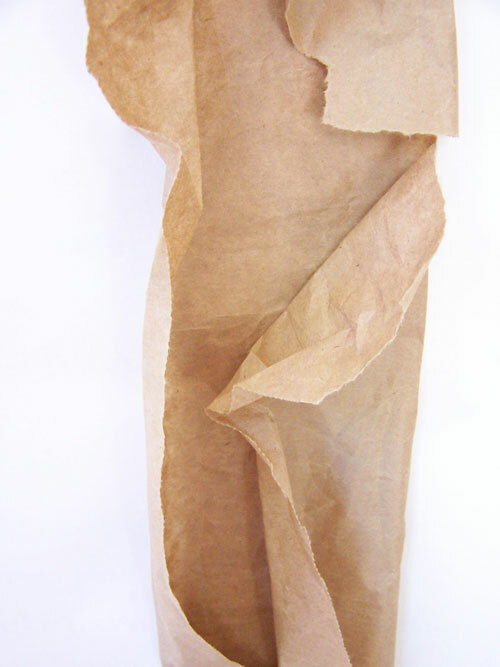 We used the back side of a roll of wrapping paper I wasn’t particularly fond of for the backdrop. We attached it to the wall using painters tape. 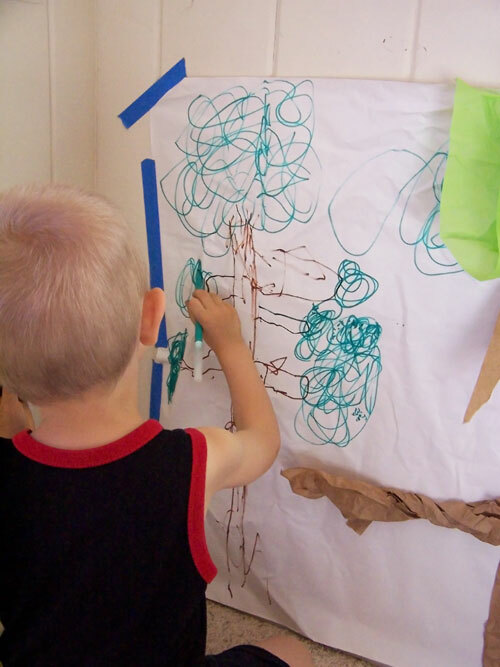 The boys started by drawing some trees. 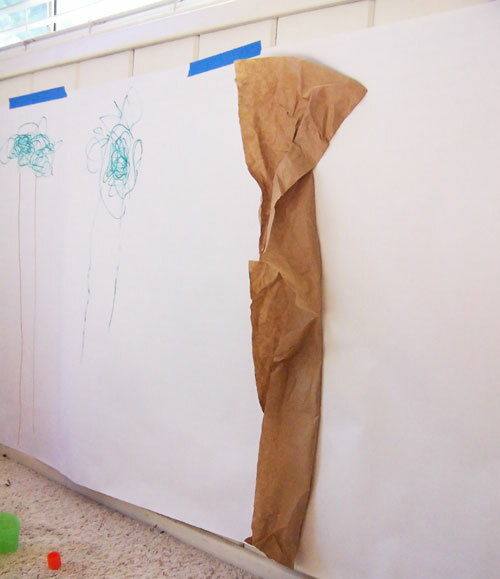 Then we glued on large brown strips of paper to make more trees, using the packing paper that comes in our Amazon packages. We added a few twisted branches, and glued green tissue paper to the tops of the trees. 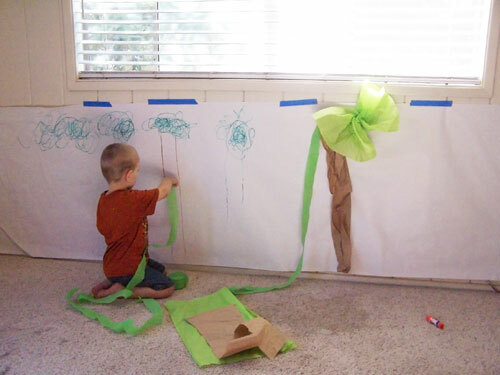 We used green streamers to make vines. Here Malcolm is using pointillism to make a tree, like Creative Galaxy talked about in one episode showing the painting A Sunday Afternoon on the Island of La Grande Jatte. 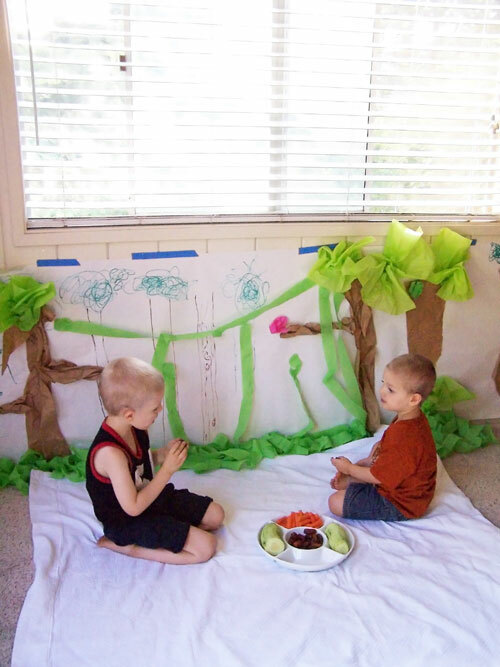 Once they were happy with the jungle, we pulled out a blanket to sit on and had a snack. 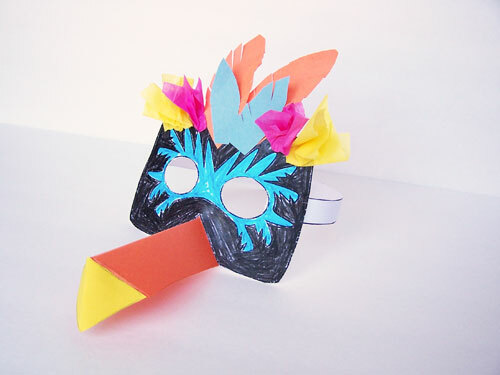 Come back Wednesday for the printable version of this toucan mask, plus a monkey one!